In this part we will explore the meaning of the 57th Shloka of Sri Vishnu Sahasranamam. Bhagavan is Maharshih because, in His incarnation as Sage Kapila, He realised the three Vedas by intuitive perception. 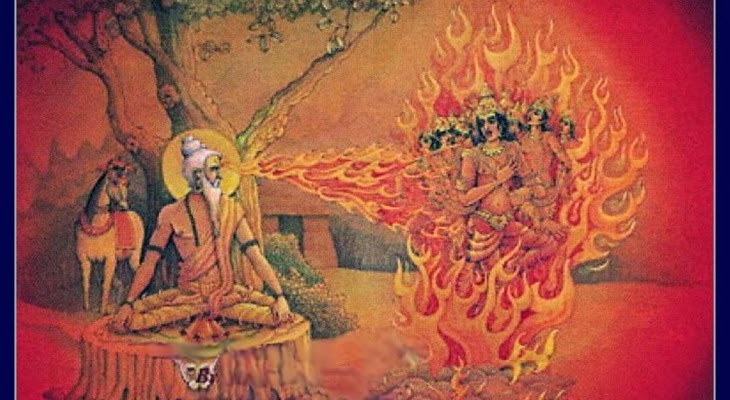 Sage Kapila with his lustre, like that of a burning and smokeless ember, was an embodiment of Jnana (Knowledge) and this signifies his flawless attributes. Kritam is the world He has created, Jnah means the knower of the world and He is Kritajnah because He is both the world and its knower. He is the Lord (and protector) of the world. He is the propounded of the three Tattvas (Pradhana, Purusha and ParamAtma). He also triumphed over the three worlds with His three giant strides. Bhagavan is the presiding Lord of the three states of consciousness namely waking, sleep and dream states. He protected the Earth with His huge horn in His Matsya and Varaha Avataars. He also brings about the end to His creations as Samkarshana before he recommencing His act of Creation yet again. Sri Adi Sankara takes Maharshih KapilAcharyah as a single Nama. He explains this as ‘Maharshih Kapilacharyah iti Savishenam ekam Nama – This is a single Nama Kapilaachaaryah with the built in adjective Maharshih’. The word Maharshih is to be interpreted as ‘Mahaan chaasau Rishishcha Maharshih – He is a great sage’. An ordinary Rishi is an expert in only a few sections of the Vedas but a Maharshih is one who has mastered the whole Veda. Acharya is a great teacher and Kapila is called KapilAcharya as He is the author of the great text on the Sankhya philosophy. On the whole this name refers to Bhagavan’s appearance as the great Rishi and eminent teacher Kapila. Sri Adi Sankara quotes the following texts in support of this. 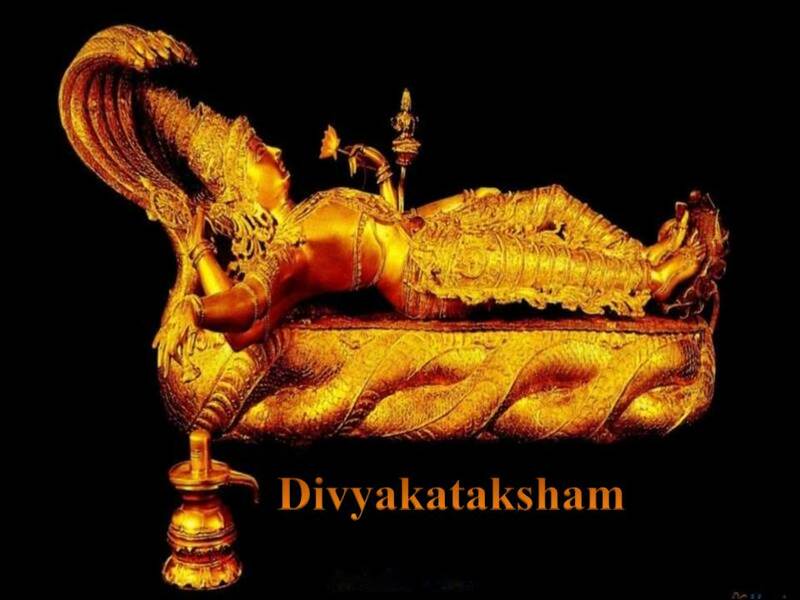 The first is ‘ShuddhAtmaVijnaanam Sankhyam iti abhidheeyate – The pure knowledge of the self is called Sankhya’. The second (Svetasvatara Upanishad 5.2) is “Rishim prasootam Kapilam – Kapila was a born sage’. The third interpretation is from Srimad Bhagavad Gita (10.26) which says ‘Siddhaanaam Kapilo Muni – Among the truly enlightened seers I am Kapila Rishi’. Bhagavan is Maharshih because, in His incarnation as Kapila, He realized the three Vedas by intuitive perception (Rshir-darSanAt -niru. 2.11 – Satyadevo Vasishtha). He is known for chanting all the Vedas without a break – Srutih Rig Adyaah vaktrebhyah prodgirantam atah smaret. 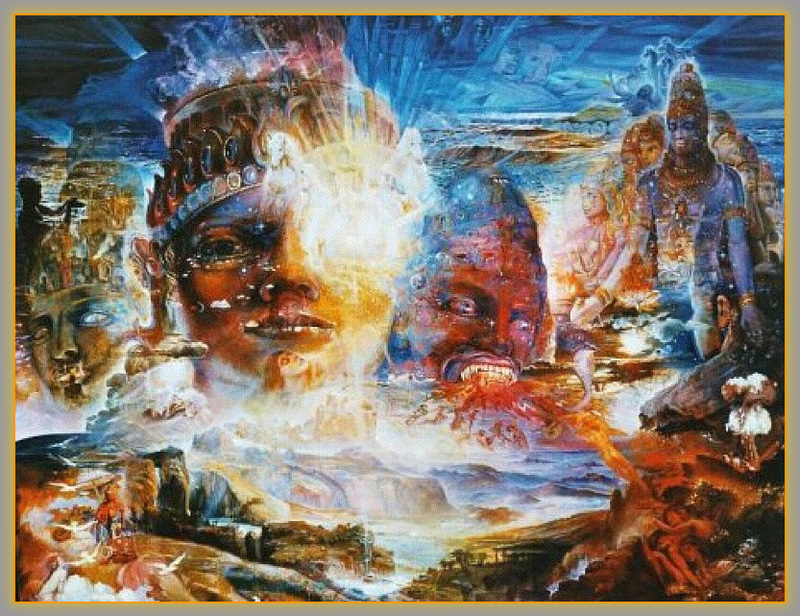 Sri Parasara Bhattar gives reference to Svetashvatara Upanishad 5.2 – Rishim prasutam Kapilam mahaantam – Kapila, who was a seer from His birth. 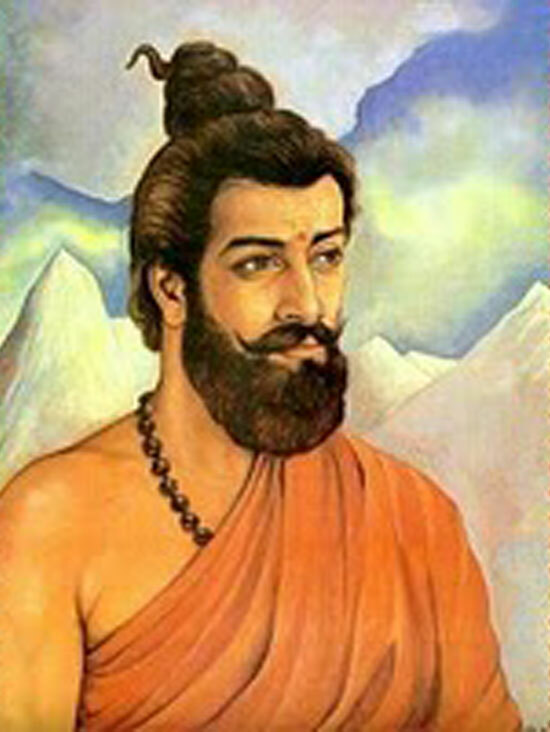 He is also a Maharishi for His propounding the Sankhya system – Sankhyasya vakta Kapilah paramrshih sa ucyate . Swami ChimayAnanda, like Sri Sankara, takes the two Namas together as Maharishih Kapilacharayah and explains that He is the One who has manifested as the teacher Kapila, the great Sage, who mastered the entire Vedas and propounded the Sankhya philosophy. Sri Parasara Bhattar says Kapilashcaasau Acharyashca iti KapilAcharyah – Kapilam refers to the inside colour of a tree; Sage Kapila’s name signifies His complexion which resembles that of smokeless fire. The mantra to meditate on Him is “Nirdhumaangaara Varnaabham Sankha Padmaaksha Sutrinam” – He who possesses the lustre of a burning and smokeless ember, who has Sankha and Padma beads in His hand. KapilAcharyah with His lustre, like that of a burning and smokeless ember, was an embodiment of Jnana (Knowledge) and this Nama signifies his flawless attributes. The mantra referring to this attribute is “Samvit Prakaashanaaya” – He Who spread the knowledge. Sri Satyadevo Vasishtha gives a nice and crisp definition of an Acharya – ‘Acharati svayam, Sishyebhyashca Achaaram Graahayati iti Acharyah – An Acharya is one who observes the sad-dharma himself, and also imparts the knowledge of this sad-dharma to his disciples. We have already seen this name, which occurred earlier as Nama 83. The meaning given here is to look at this as a combination of the two terms Krita and Jnah. Sri Adi Sankara explains this as ‘Kritam kaaryam Jagat, Jnah Aatmaa, Kritam cha tat Jnah cha iti Kritajnah – Kritam is the world He has created, Jnah means the knower of the world and He is Kritajnah because He is both the world and its knower’. The world by itself is inert and has no consciousness. There is a Universal Consciousness, which perceives and knows the world. Bhagavan is the combination of the two and He is both the Prakriti and Purusha. He is the Creator and the Created. Sri Satyadevo Vasishtha gives the interpretation – Kritam jaanaati iti Krtajnah – He Who knows precisely everything there is to know about His Creation. He knows the why, when, how, where, what, and precisely for how long of everything He has created. Swami ChinmayAnanda interprets this to mean that He is the Creator and the Created. Sri Parasara Bhattar explains this Nama as Sukrtameva jnatavaan iti Kritajnah – He Who remembers the good deeds done. In this context Sri Bhattar refers to Sage Kapila’s encounter with the sons and the grandson of King Sagara, a descendant of the Ikhsvaaku race. 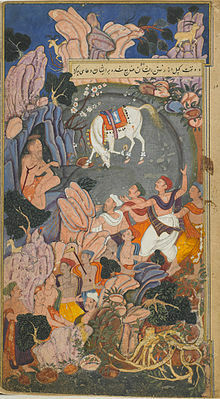 As King Sagara prepared to perform the Ashwamedha Yagna, his courtiers informed him that the sacrificial horse had gone missing. King Sagara ordered his 60,000 sons to track down the horse and fetch it. The proud and arrogant princes raged across the Earth burning and destroying places in their quest to find the horse. They finally arrived at a quiet spot where Sage Kapila was meditating and they were relieved as well as livid to find the horse tied beside him. The sons believed Sage Kapila had abducted the horse and instantly disturbed his penance by attacking him. The Sage was furious at their audacity and burnt them all to ashes with his fiery gaze. King Sagara was worried as he had not heard back from his sons. He sent his grandson Amshuman in search of them. Amshuman followed the path which his uncles had taken and finally finds Sage Kapila with the horse. He approaches him respectfully and asked him about the whereabouts of his uncles. Upon being told that they were burnt to ashes, he becomes inconsolable. Sage Kapila told Amshuman that only his grandson Bhagiratha can secure the release of his uncles by bringing the Ganges down from the heaven as the Ganga will purify them of their curse. Amshuman reported the sad news to King Sagara who becomes grief-stricken. He crowned Anshuman as the King before his death. Throughout his life King Amshuman struggled to bring Ganga down but didn’t succeed. His efforts were followed by his son Dilipa who also tried to bring Ganga, but in vain. Bringing Ganga back to Earth was a near impossible task and required many years to be spent in tapasya (penance) and prayer. Bhagiratha, the son of Dilipa and grandson of Amshuman, turned over the kingdom to his trusted ministers and set off to the Himalayas to perform the arduous penance to bring Ganga down to Earth. He undertook severe penance for a thousand years under harsh conditions to please Lord Brahma. Lord Brahma was pleased with his efforts and granted him a wish. 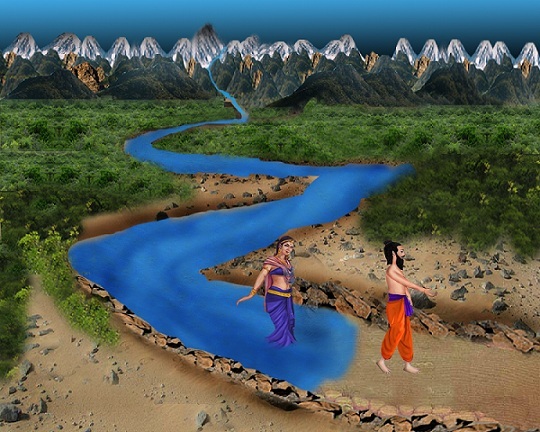 Bhagiratha asked Brahma to bring the river Ganga down to earth so that he may perform the rituals for his ancestors. 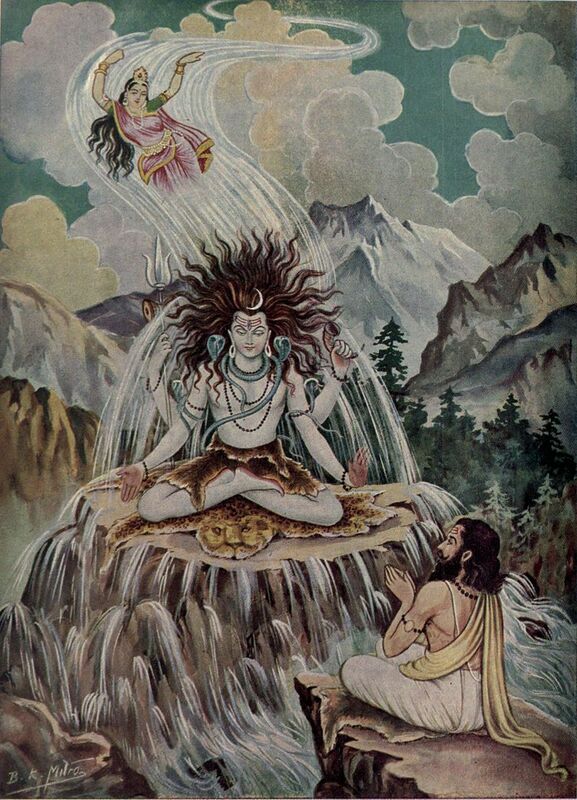 Brahma asked Bhagiratha to propitiate Lord Shiva, for only Lord Shiva was capable of breaking Ganga’s torrent. Lord Brahma explained that Lord Shiva can contain the destructive impact of strong flow of Ganga from heaven to Earth. Bhagiratha performed a penance for Lord Shiva, living only on air. The compassionate Shiva appeared after a year’s penance and assured Bhagiratha that he would make Ganga land on his matted locks. Accordingly Lord Shiva let Ganga go flow freely after crushing her vanity. She flowed fiercely and destroyed Jahnu Rishi’s ashram in the process. This angered Jahnu and he used his spiritual powers and drank Ganga as ‘aposhanam’. Bhagiratha again prayed to Rishi Jahnu and pleaded to free Ganga. Rishi Jahnu was pleased with Bhagiratha’s sincerity and freed Ganga. Hence, Ganga is also known as Jahnavi. Bhagiratha led the way for Ganga, and she followed him across the north and east of Bharat before finally merging with the Ocean. In her course she washed the ashes of Sagara’s sixty thousand sons, who ascended to heaven while praising and blessing Bhagiratha. 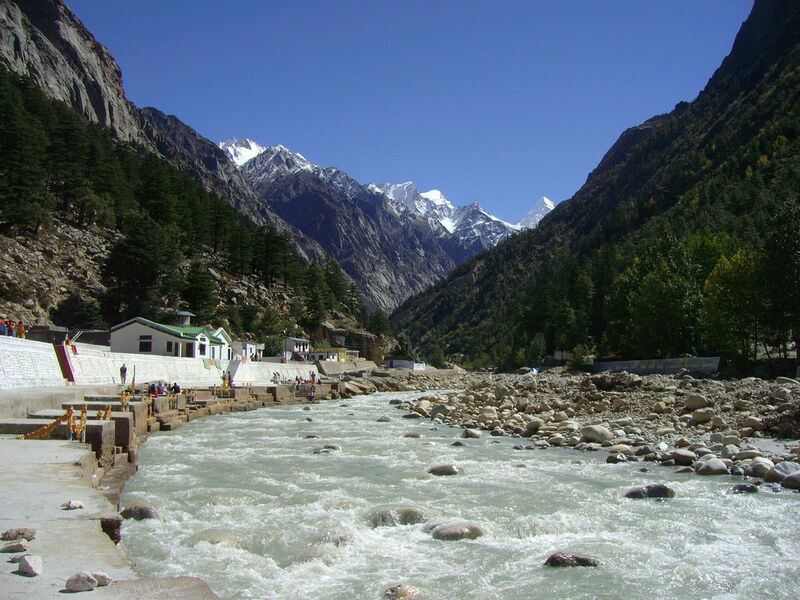 To commemorate Bhagiratha’s efforts, the head stream of the river Ganga is called Bhagirathi, till it meets the Alaknanda River at Devprayag. Bhagiratha’s own great effort was praised by all the Gods and his ancestors, and is known as ‘Bhagiratha Prayatna’, as proclaimed by Lord Brahma. It is a great inspiration to any man who seeks to do something noble despite facing overwhelming odds. Kritajnah, in this context, means he remembers the good deeds done. 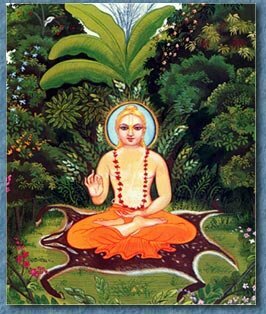 Sri Adi Sankara interprets this as ‘Medinyah Bhoomyaah patih Medineepatih – He is the Lord of the Earth’. Having created the world, Bhagavan continues to bear the ownership and full responsibility for its maintenance hence He is the Medineepatih. This Nama has similar import to MahiBharthah which we covered earlier (Nama 184). At the time of Creation, when the Earth sank under water, at the request of Brahma, Bhagavan as Varaha Avataar, retrieved the Earth and supported it. Meaning: He is the Grand Father, Brahma’s father, Rudra’s father, the Sage’s father, the Gods’ father, and the sole father of the world, O’ Devotees, master this decad out of the thousand Pasurams sung by the Azhwar and you too can attain liberation. 5. He is the Lord of the past, present, and future. Sri Adi Sankara explains this as ‘Treeni Padaani asya iti Tripadah – He who triumphed over the three worlds with His three giant strides’. He interprets this Nama in terms of Bhagavan’s Vaamana (Trivikrama) Avataar where He conquered the Asura Mahabali with His three gigantic strides and supports it with the quote from Taittriya Brahmana 2. 4. 6 – ‘Treeni Padaa Vichakrame’. Sri Parasara Bhattar refers to the three tattvas: Pradhaana (non-sentient matter), Purusha (the individual soul), and ParamAtma (Super soul). These are also referred to as Bhokta (the individual self), Bhogya (the objects of enjoyment or the non-sentient matter), and Niyanta (the Ruler). Tri-padah can also mean that He is represented by the three words or syllables of the Pranava – AUM. In His Varaha Avataar, Bhagavan assumed the form of a boar with three humps (Tri-padah) – tavaivaasam trika-kudo Varaaham RupamAsthitah (MahA. moksha. 343.63) – “I assumed the form of Varaaha (Boar) with three humps”. Sri Radhakrishna Sastri explains that the three Tattvas refer to the three states in which Bhagavan manifests Himself – as One who protects the world, as one who protects the Devas who protect the world, and as Srivaikuntha Naathan in NidraYoga, disassociated with this world. Sri Sastri gives an alternative interpretation: Bhagavan measured this world with one step and covered all the Sthula belongings of MahaBali, with the second step He measured all the Sukshma belongings of MahaBali such as Svarga which he would have achieved in his future births through His current good deeds, and through His third step He removed the Ahamkara and Mamakaras of MahaBali and sent him to the eternal Parama Padam. Sri Sastri also gives an additional explanation that Bhagavan has His Feet (i.e., His Adhipatyam) in the past, the present, and the future, and so He is called Tri-padah. Swami ChinmayAnanda explains this Nama by indicating Bhagavan’s Vamana (Trivikrama) Avataar and says He measured the entire Universe in just three steps. The Jiva, the limited ego, meaning the seeker has also to take three steps forward to overcome the delusion of the three states of sleep, dream and waking. Sri Adi Sankara interprets this as ’Gunaaveshena sanjaataah tisro dashaah avasthaah jaagrat aadayah taasaam adhyakshah iti Tridashaadhyakshah – He is the presiding lord of the 3 states of consciousness namely waking, sleep and dream states which are influenced by each person’s innate qualities hence He is called Tri-dasha-adhyakshah’. Dashaa means state and here it means state of consciousness. Everyone can remain in any of the three states. He can be fully awake and conscious when all His senses are active and engaged in sense objects. He can also be sleeping when all senses are closed. While sleeping He can acquire the dream state when His senses are open in a world of His own creation while remaining closed to the external world. How much period one spends in each state is a function of one’s own Saatvic, Raajasic and Taamasic qualities. The Saatvic person probably spends least time in sleep whereas the Taamasic person will spend most of his time in sleep. Bhagavan is the ultimate controller of all the 3 states. The Atman representing the Bhagavan is still there and provides the continuity between the different states. Sri Parasara Bhattar interprets the term Tri-dasha to refer to the thirty three gods and explains the Nama as signifying that Bhagavan is their Adhyaksha and helps Brahma and others when they encounter difficulties in their functions after the pralaya (Brahmadeh pralaya Apat sakhatvaat). Prof. Srinivasa Raghavan adds that the term Tri-dasha, which means three times ten or thirty, is a rounded number which refers to the thirty-three Gods (Eight Vasus, Eleven Rudras, 12 Adityas and the two Ashvins). 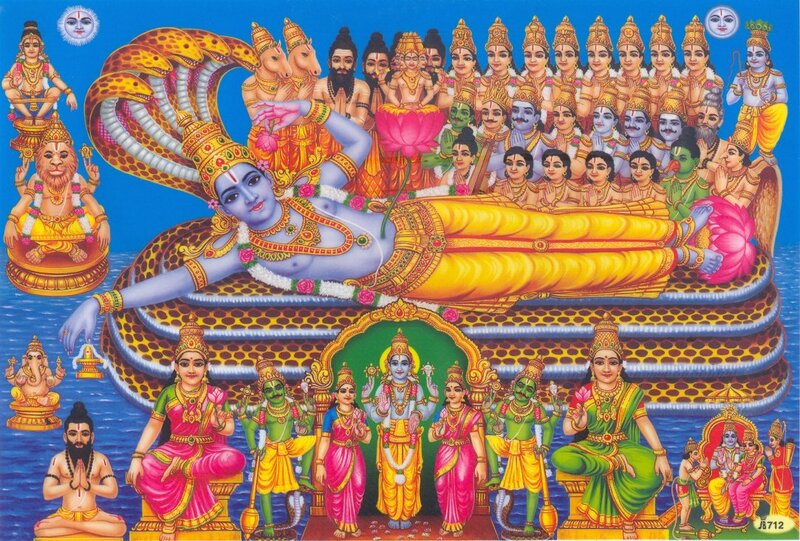 In ThiruppAvai (20) we have reference to the thirty three Devas – Muppatti moovar amararkku mun sendru kappam tavirkkum kali – The warrior who leads the hosts of thirty-three celestials and allays their fears! Sri V.V. Ramanujan explains how Bhagavan has been the Savior of the Devas during Creation soon after Pralaya. When the world was submerged under water, and Brahma could not proceed with Creation, Bhagavan took the form of the Big boar (Varaha) and lifted the earth out of water and thus helped Brahma in his task. Swami ChinmayAnanda extrapolates the term to mean the three Gunas – Rajas, Tamas, and Sattva. Thus Bhagavan is the Lord of the three states, or One who has mastery over the three Gunas and remains unaffected by them as Guna Theetha. Sri Adi Sankara relates this Nama to the Matsya (the Big Fish) incarnation of Vishnu. 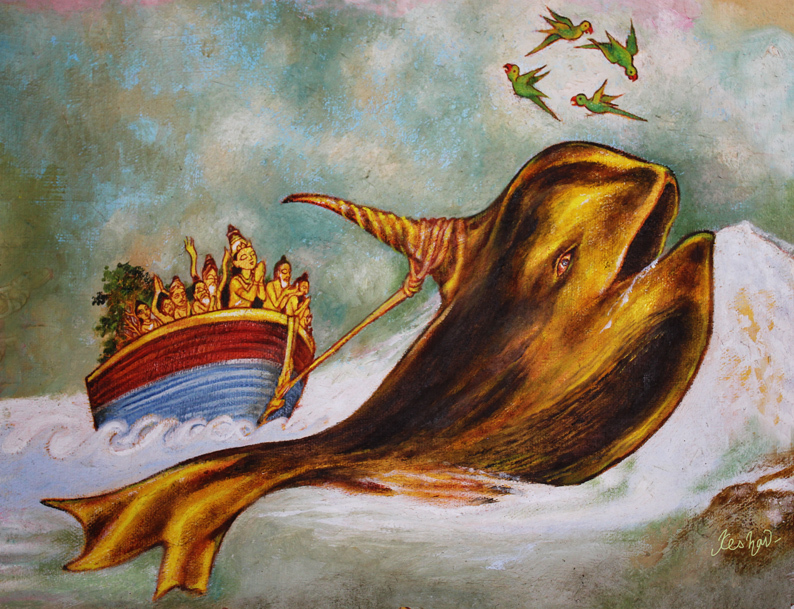 He explains the name as ‘Matsyaroopi mahati shringe pralayaambhodhau Naavam baddhvaa chikreeda iti Mahaashrigah – When He took up the Matsya Avataar (the great Fish) He attached a big boat to His huge horn with Satyavrata in it and enjoyed Himself thoroughly in the endless deluge hence He is called MahaShringah, the one with the enormous horn’. Meaning: You are Lord Narayana Himself the glorious God, who wields the discus. You are the Divine Boar with a single horn, the conqueror of your past and future enemies. You are Brahma, the imperishable, the Truth abiding in the middle as well as at the end of the Universe. You are the Supreme righteousness of people, whose powers go everywhere. You are the four-armed. He lifted the Earth from the waters with the tip of His tusk, and the Earth appeared like the leaf of a lotus besmeared with mud on the tusk of an elephant that has entered a Lotus-pond (Vishnu Purana 1.4.36). Sri V.V. Ramanujan explains that the horn or tooth of this Varaha Avataar was so huge (MahaShingah) that the Earth looked like a small particle of food stuck at the tip of the tooth of this huge form (Srimad Bhagavatam). Sri Adi Sankara gives two meanings for this Nama. The first is ‘Kritasya Samsarasya antam samhaaram karoti iti Kritaantakrit – He ultimately brings an end to what has been created by him hence He is called Kritaantakrit’. Krita means what is created by Him as we have seen in the name Kritajnah. Anta means end or termination. Krit means one who acts. So in effect this means that, He is the destoryer of His own Creations as Samkarshana. The second interpretation is ‘Kritaantam Mrityum Krintati iti vaa Kritaantakrit – He puts the Mrityu deva, the god of death in check hence He is called Kritaantakrit’. The import of this that even Yama the God of death is under His control and cannot act independently of Bhagavan. Meaning: He came as a boar and took the beautiful Earth without any damage to it. The celestials worship him with proper means and circumambulate Him with joy. He is a body of knowledge-light residing in the Ocean in Yoga Nidra with head rested towards the forest. Those who contemplate on Him are our masters. The Dharma Chakram writer adds that just as the farmer who sows the crop also destroys it for the ultimate benefit of His creatures, Bhagavan creates and then destroys what He created, for the ultimate benefit of the Jivas. Bhagavan is Kritaantakrit and brings about the end to His creations as Samkarshana before recommencing his act of Creation yet again. Bhagavan is Maharshih because, in His incarnation as Sage Kapila, He realised the three Vedas by intuitive perception. Kapilam refers to the inside colour of a tree; KapilAcharyah with His lustre, like that of a burning and smokeless ember, was an embodiment of Jnana (Knowledge) and this signifies his flawless attributes. Kritam is the world He has created, Jnah means the knower of the world and He is Kritajnah because He is both the world and its knower. He is Medineepatih as He is the Lord (and protector) of the world. He is the propounded of the three Tattvas (Pradhana, Purusha and ParamAtma) and hence He is called Tripadah. He is also known as Tri-padah because He triumphed over the three worlds with His three giant strides in His Vamana (Trivikrama) Avataar. 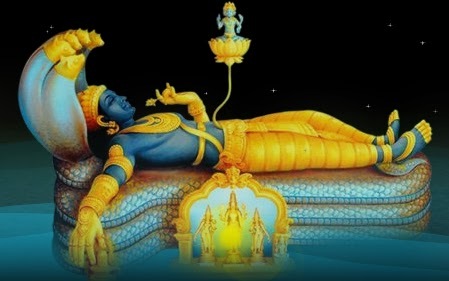 Bhagavan is the presiding Lord of the three states of consciousness namely waking, sleep and dream states and hence known as Tri-dasha-adhyakshah. He protected the Earth with His huge horn in His Matsya and Varaha Avataars and hence known as MahaShringah. He is Kritaantakrit and brings about the end to His creations as Samkarshana before recommencing his act of Creation yet again. Tritandi jeer in his upanyasams gives multiple interpretations for krtajnah viz 1) He Who remembers the good deed done. 2) He Who is both the Created and the Creator. 3) He Who knows everything about His Creation. 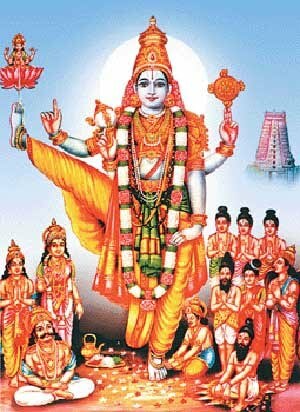 om krtajnaya namah.